The pregnancy had been usual. The Quarter Horse mare shifted her great weight uneasily as her due date approached. Her sides swelled and rippled with twinges of new life within. Mother Nature was preparing the mare for her first foal, slowly filling the udder to compliment the now pendulum shaped belly. The huge muscles of the croup and dock began to relax. Her owner-in-waiting already owned two paternal purebred brothers of Morgan descent. Her Quarter Horse mare had developed a cancerous tumour that didn’t bolster well for her future. As the tumour seemingly went into a state of remission, it was decided that the mare be bred. The planned pregnancy to the same sire of her Morgans would yield a special part-bred. It would be the mare’s legacy, should she pass. I walked down the wide aisle peering into the occupied stalls of expectant moms. All was well in the quiet of early dawn. At first glance I didn’t notice anything unusual as the Quarter Horse mare, two weeks away from foaling, looked in earnest for her morning grain ration. She was her impatient self, wanting to be first in line for grub as she pushed forward to the door, ears pricked straight ahead and head nodding in anticipation. As I turned to check the next box, I caught a glimpse of what appeared to be a tiny bay foal, cowering in the tight far corner of the stall. I turned on my heel and rushed back, slowly entering the roomy stall. The foal stood shaking and confused with such a sad look of forlorn. I approached it in a crouched position, talking to it with a soothing reassuring voice. It was still wet, evidence of a fairly new birth. The mare showed no interest in her newborn; not even a nicker. Instead, she circled the area of her grain bin with a wide-eyed look demanding her feed. As I eased the fragile looking filly towards her mother, the mare tempestuously moved away. My first reaction was that the mare’s sensitive abdomen was making her understandably cautious of touch. The now full udder had no relief as the milk had not been let down by the natural process of nursing. This behaviour is not unusual in a maiden mare that hasn’t experienced foaling before. The thought of being bumped and probed by a clumsy foal in search of nourishment in such a sensitive area is not inviting. Still, the maternal need to protect and feed a newborn foal usually is an over-riding instinct that prevails long after the pain of birth subsides. Whatever quirk of nature that afflicted this mare would seal the fate of this filly if immediate action wasn’t taken. It was obvious that managing an unsteady foal and an aggressive mare was not a one-person job. The owner was subsequently summoned to the stable. The owner held the mare while I attempted to steer the filly cautiously towards the side of the mare’s full quarters. This met with more hostility and aggression from the mare. Nothing we did, no form of restraint not even a leg hold or twitch, was going to coerce the mare into accepting her baby. She stubbornly would not acquiesce to the suckling needs of her baby. More medical intervention was urgently required. Before attempting to hand milk the mare, the veterinarian administered the usual spectrum of antibiotics. The mare was becoming very dangerous with deadly aim from her hooves and barred teeth that could bite into flesh with a viciousness of a she wolf. Without life-saving colostrum from the mare’s first milk, there was no chance for this filly to survive. The minutes and hours quickly passed unmercifully. A hurried rush to a local Thoroughbred horse-breeding farm that maintained a colostrum bank, bought the filly some hours of hope in her now apparent fight for life. The mare was partitioned off, just enough so that she couldn’t strike or attack the foal. The tiny filly now had a reprieve from the unrelenting advances of her angry and confused mother. It was hoped that by seeing her filly close by, without human intervention, the mare might become the mother that her foal so desperately needed. After 30 hours of supervised cohabitation with no favourable change in the mare’s behaviour, meant that a new plan had to be hatched, and hatched quickly if this little filly was to have any chance at all. The mare’s next-door neighbour was the Morgan mare, Kennan’s Memory. Memory already had a two-week-old filly at her side. She would be the closest thing to a nurse mare that we could find. Of all the Morgan broodmares in the stable, Memory would be the most likely candidate for this life-saving task. 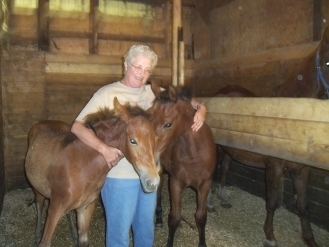 She was a mom’s mom, very devoted to her foals and watchful of others. Would it be possible for her to adopt this now orphaned foal? A nurse mare that accepts a strange foal usual does so as a result of her natural born foal being taken from her and a substitute foal added. This was not the case here. Clearly, it would be up to the good graces and willing heart of Memory to allow another mare’s foal under her belly. Memory was brought out into the aisle way with her 14-day old filly foal placed by her chest. The mare was held steady as the shy little rejected filly was cautiously brought along side. Memory raised her hind leg ever so gently as a mild warning, turning her head and staring perplexed at the wee starved filly. But as we asked Memory to behave with a strong firm voice, she lowered her leg without hesitation. The filly was guided gently to the full udder of the mare. Within minutes the hungry filly had latched on to a teat and for the first time in her short stressful life, sucked contently. Memory looked back at the alien foal reaching beneath her hip. Memory was unsure as her ears constantly moved back and forth without ever flattening, trying to decipher what was happening. After a long and much needed grasp of the full teat, the filly was finally satisfied. Safely housing a mare with two nursing foals was our next challenge. The farm’s six-horse trailer was brought into the indoor arena. For the next week it would double as a nursery on wheels. Memory was led into one of the middle stalls at the rear section of the trailer and tethered. A haynet hung from the ceiling hook and a water bucket was fastened to the front stall bar. The other three stall partitions at the front of the trailer were removed allowing the two fillies full run of the trailer while being able to nurse from either side of the mare with the half partitions of the stall stanch allowing access and protection. A deep straw bedding provided a safe landing and warmth for much needed snoozing. During the day, the mare and foals were turned out in a small round-ring, which had ground-to-rail, full screen plastic mesh surrounding the perimeter. It was in essence, an over-size playpen. Every couple of hours, Memory would be held with a shank so that the little filly, now nicknamed Orphan Annie, could nurse. Everyday since birth, Annie’s natural mother was introduced to her in hopes of reconciliation. Each time the mare attempted to attack the filly when she came too close. After two weeks of futile custodial meetings, it was evident that this mare would not realize the role of motherhood and so the daily visits ended. After a week of nightly trailer sleepovers, the foaling stall in the barn was converted over to replicate the horse trailer’s new nursery blueprint design. A stock was provided for the mare with easy access for the foals to nurse. Day-by-day Memory slowly accepted the rejected Annie to her udder. Annie’s big paternal sister, Primrose, showed a distinct but natural propensity for jealously during the first couple of weeks. She often would shove Annie out of the way when she wanted to nurse, or kick at her in defiance as if to say this is my Mom, not yours. By the third week, Primrose had softened her attitude and accepted Annie as her little sister and playmate. No longer wrought with jealousy, Primrose showed clinginess to Annie. Everyone had hope that this would work out for the best. Yet, there was to be one more major hurdle that Annie had to overcome. One evening feed, I entered the stall of the two fillies, brushing Primrose then Annie aside to put in their booster milk replacement bucket. Annie stood motionless. I pushed harder and she stumbled forward and down. Something was terribly wrong. Her right front leg was totally useless. I immediately felt for any sign of fracture, but there was no discernible heat, just a scrape on her cannon bone. My next thought was a dislocated shoulder. I was puzzled as I dragged her to a safe space in the stall away from crushing hooves. Paralysis was my next suspicion. I talked the on-call veterinarian into making the late night trek out and examining the filly. If it was a break, I didn’t want to leave the filly unattended and without treatment that long. The result of the veterinary examination confirmed a paralysis. It was suspected that Annie had rolled under the partition that held the mare and was stepped on sometime during the evening. The crush had caused nerve damage involving the mobility of the entire right front leg, originating in the shoulder region. A splint was fashioned to try and support the leg and keep the fetlock flexed in a more normal position enabling her to have some weight bearing on the injured leg. It was an awkward predicament for Annie and one that might have snuffed away any chance of a normal life or life itself. Annie struggled clumsily around the stall at night and round ring in daylight. She dragged that leg showing no legitimate effort to use it. The prognosis didn’t look favourable, but the filly was determined to feed herself, lie down and follow her big sister. Weeks passed with little improvement. After reassessment, it was decided that the crutch splint should be removed. It seemed to hinder and impair more than it supported. The fetlock and leg were bandaged for protection, as dragging her leg behind her meant certain abrasions and possible infection if not guarded properly. Her leg now free of its brace, Annie was determined to make her leg work. Like most soft tissue injuries, they can be a nightmare in recovery. Slowly sensation returned to her shoulder, transferring eventually to her forearm. It was a considerable length of time before the knee became somewhat functional. The fetlock was the last to show signs of life and movement. It would take weeks if not months for Annie to regain most of her movement and strength back while continuing the rapid foal growth. As she convalesced, the bonding between her big sister Primrose and step mom Memory grew closer. No longer did Memory try to push her away but instead circled and protected her from the rest of the broodmare band. Primrose looked after Annie as well, shadowing her everywhere and being her constant playmate and protector. As the days passed, Annie and her sister joined the expanded herd of other youngsters and soon they all cantered across the pasture kicking up with squeals of delight. Now weaned, Annie continues to mature. Although small in stature, her early life experiences have toughened her in the herd. The human bond has been cemented in her very being, as she looks to people as protector and friend. Still, without the sweetness and affection of a kind old broodmare named Memory, it was uncertain if Annie would have lived. Now there is no doubt. I have enjoyed a life-long commitment to horses spanning more than 40 years. I am also a published poet and writer. My articles have appeared in many national and international equine magazines such as Horse Sport and Equus to name a few. I am also a respected trainer and breeder of champion Morgan horses. My memoirs were published in late December, 2010. "Between the Irons" is now a 5 star rated book release.